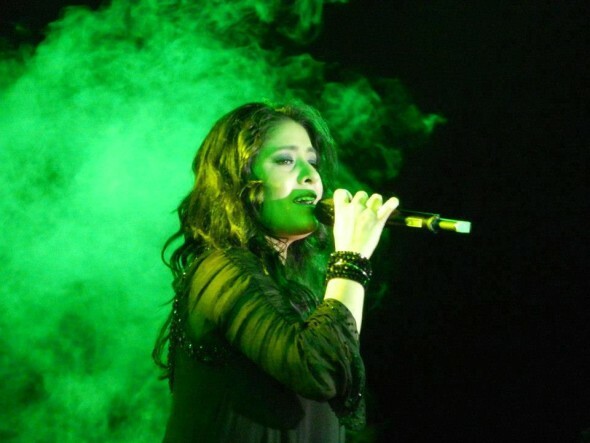 Noted Singer and performer Sunidhi Chauhan rocked her performance at her Concert held at Gogte institute of Technology Belgaum. The event was organised by KLS Gogte Institute of Technology, Belgaum at College ground as a part of annual cultural fest AURA. More than 12000 students, staff and Belgaumites attended the event and were mesmerized with Sunidhi’s blockbuster songs in an electrifying atmosphere with ultra modern and sophisticated international quality sound systems, which were used for the first time in this part of the state. Danced in tunes of melody queen Sunidhi songs made the students to go over the songs once more. Ms. Sunidhi Chauhan appreciated the efforts of KLS Gogte Institute of Technology for the technical arrangements and thanked the audiences for overwhelming response. Had a FABULOUS concert at Belgaum 🙂 OMG guys!!! More than 12000 plus people enjoyed the concert. Her performance was mesmerizing and all those who attended enjoyed every bit of it.